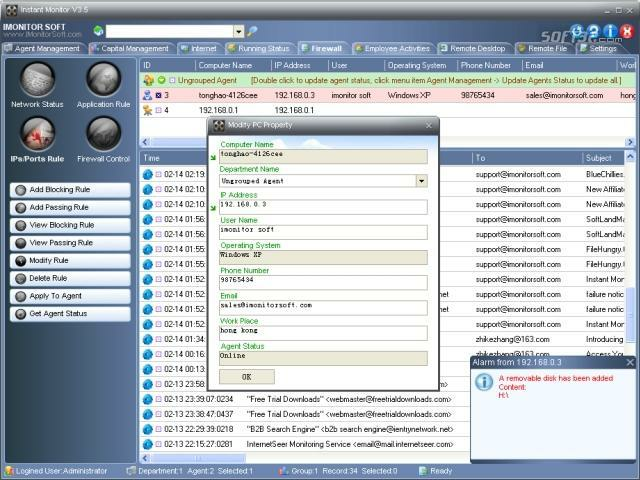 360 Monitor allows you to monitor employee's activities on all network computers, such as email, instant message, keystrokes, FTP file transfer, websites visited, applications used, etc. 360 Monitor also can log file operations on employee's computer, such as copy, delete, create, rename, open, copy file to removable disk, etc. Send alarm to console computer when employee do a file operation on removable disk, add or remove a removable disk, open an unwanted website, send or receive mail, transfer file with FTP protocol, etc. You can also see live screenshots of multi network computers and take a control of a remote computer by controlling it's mouse and keyboard, this is especially useful when you need to assist the person who uses the remote computer, and you can edit file, open file, download file and upload file remotely. 360 Monitor also can restrict remote computer's browsing in Internet Explorer, restrict remote computer's application using, restrict remote computer's network accessing, send instant message and command (e.g. shut down, restart, run program, open website) to remote computer. Additionally 360 Monitor provide a powerful remote task manager, allows you view all processes on remote computer and end any of them. And 360 Monitor can log alteration of hardware and software on all network computer automatically, you can easily manage your corporation's computer hardware capital and software capital.